Ensure your web site design looks great on tablets, and mobile devices such as iPhones and iPads in addition to looking sensational on traditional desktops and laptops. Yes, we are web designers and we eat, drink, breath and sleep web sites. However, you don't need us to tell you that people are increasing viewing web sites on mobile phones and tablets. As business owners, we need to ensure that when someone visits our web sites, they enjoy their experience and ultimately buy from us. If, when they visit our web sites they are squinting to see the images or read the text, they are most likley going to leave our site and move on to someone else's. The web language gurus at WC3 recognised some time ago that a different method of presenting web sites would be required for mobile devices. So, they set about enhancing the main web designers languages or HTML and CSS. This enables web designers to craft web sites that are intelligent enough to recognise that they were being viewed on a mobile device and to adjust themselves accordingly. This enables viewers to read the web site without having to squint or zoom in, giving that all important comfortable and enjoyable user experience. 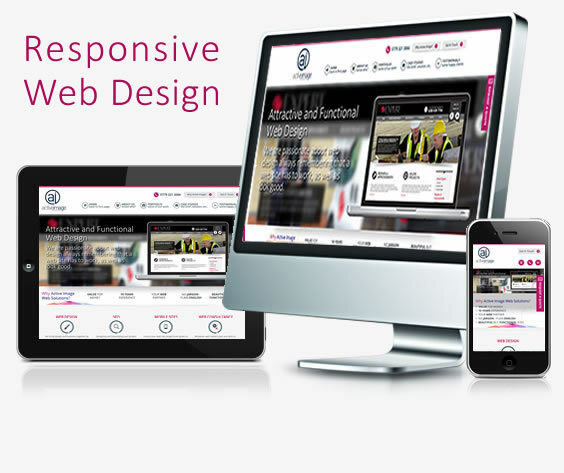 At Active Image Web Solutions we design responsive web sites as standard so you need have no concerns over losing customers because they are viewing your site on a mobile device.